There are 3 different types of muscles in the human body. Skeletal Muscle is what moves your body when you exercise, talk, and breathe. It also functions to maintain body posture and body heat. 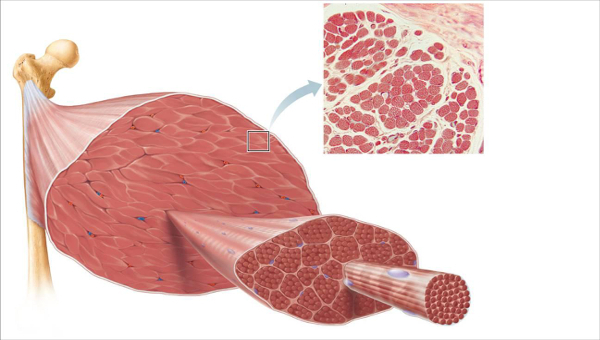 The figure above shows an example of skeletal muscle. It is made up of bundles of muscle fibers, each with the ability to shorten and lengthen through contractions which move the body. Cardiac Muscle is only found in the heart and it makes it beat. Smooth Muscle can be found in body organs and vessels. It works to move solids and liquids through the digestive tract and secrete things, including urine.